The Ghana Standards Authority (GSA) has proposed that the best way to avoid counterfeit electrical products is to purchase from the manufacturers authorized distributors or retailers. Mr Francis Mensah Akpaloo, GSA Standards Officer, who gave the tip, also urged the public to scrutinize labels and packaging of products before purchasing to detect any missing dates and codes or any unusual sign on the product, which should trigger extra caution. 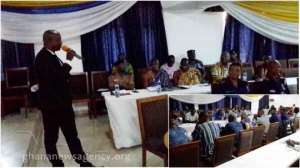 Mr Akpaloo, who is also the GSA Technical Supervisor stated at a workshop sponsored and organised by Communication for Development and Advocacy Consult (CDA Consult) at Ho, Volta Region, on the theme: 'Avoid Patronage of Counterfeit Electrical Products'. The workshop was to assist stakeholders to identify counterfeit electrical products, expose the dangers associated with patronage of counterfeit electrical products, develop regional roadmap for dealing with counterfeiters and create a platform for security operatives to enforce laws against the sale of counterfeit products in the country. The GSA Technical Supervisor cautioned the public to compare the price of products to similar products at different retailer shops and 'Verify authenticity through regulatory apps, which helps to detect if a product is original or fake'. Speaking on the sub-theme: 'Basic tips for detecting counterfeit electrical products,' Mr Akpaloo explained that product counterfeiting is a form of customer fraud as a product is sold purporting to be something that it is not. 'When shopping for electrical or electronic appliance, you may stumble across a product with a price far below what other competitors are selling their product for. 'If this happens, you have probably spotted a counterfeit electrical product. Do not be tempted to purchase it because it costs less, scrutinize it,' Mr Akpaloo cautioned, stressing that, 'Counterfeiting is essentially unacceptable'. The GSA Standards Officer noted that, because counterfeiters have no interest in building brand reputation, cost could be additionally reduced by cutting corners in the production line, engaging in environmentally unsound safety process and using inferior grade materials. He said counterfeiters are continually finding ways to circumvent detection and intentionally mislead the public and everyone along the supply chain with one main aim of making profit through the sale of cheap and inferior products. Mr Akpaloo noted that, the GSA would continue to ensure conformity to standards and reassured consumers that the authority would consistently ensure that companies adhere to standards, and that, products in the market are safe, efficient and good for the environment and for public consumption. The GSA commended CDA Consult for creating a platform for stakeholders - regulators, law enforcing officers, manufacturers and dealers, consumers, state and non-state actors to deliberate and adopt common industrial strategy to combat fake electrical dealers. Mr Francis Ameyibor, CDA Consult Executive Director explained that, counterfeit electrical products exposes users to great danger, and are rapidly creating a huge and growing problem in the country. He said the proliferation of counterfeit electrical goods and products in Ghana is assuming quite an alarming proportion, adding that, 'the electrical counterfeit market is spreading and developing at a faster pace, we need urgent steps and measures to sanitise our market'. Mr Ameyibor explained that manufacturers of counterfeit electrical products have adopted modern technology to mould the product very close to the semblance of the original…'create impression of originality, which makes it almost impossible for the ordinary person to distinguish between counterfeit and original products'. He noted that counterfeit electrical products present serious health and safety risks to consumers, 'These products can overheat or cause short circuits, leading to fires outbreaks, shocks or explosions that can kill people and produce considerable property damage'. Mr Ameyibor said the CDA Consult is collaborating with public institutions, including; the Ghana National Fire Service, Ghana Standards Authority, Electrical Contractors, Electrical Manufacturers, Electrical Shop Owners, end users, contractors, security agencies, and the media in the crusade against the proliferation of counterfeit electrical products in the country. The CDA Consult Executive Director said the crusade would also focus on equipping public officials with basic information to recognise electrical counterfeit items at first sight. It also seeks to ensure that officials take stiffer actions against dealers in counterfeit electrical products, and also to equip electricians and retailers to be able to distinguish between fake electrical products from genuine ones. Mr Ameyibor, said: 'CDA Consult is creating the platform and would build the necessary forces against the proliferation of counterfeit electrical products. We are focusing on raising awareness among the public regarding counterfeiting by organising workshops at the ten regional capitals and 150 out of the 216 district capitals. He said the national crusade against the proliferation and use of counterfeit electrical products also aims at discouraging the patronage of counterfeit electrical products and to direct taste towards genuine electrical products. The second in the series of workshops is slated for Sunyani, the Brong Ahafo Regional capital at the end of March.